Foldr will respect any password policies set on the domain in Active Directory, however the Foldr administrator can also apply password policies in Foldr to affect both domain and local accounts on the appliance itself. To configure a password policy in Foldr, navigate to Foldr Settings >> Security >> Password Policies. Policies can be set to apply to all users or specific groups or individual accounts as required. By integrating with a third party service, Foldr is able to prevent users from choosing weak passwords when they change their password through any of the Foldr apps. A weak password is considered to be one that has has previously been exposed in a data breach of any other service. This feature can be enabled within Foldr Settings >> Services >> Pwned Passwords and more detailed information is available here in this dedicated blog post. Allows trusted users or groups of users to reset nominated domain users passwords from the web app. This could be useful in an educational environment allowing teachers to securely reset student passwords or designated staff to assist with password reset without involving the IT help desk. 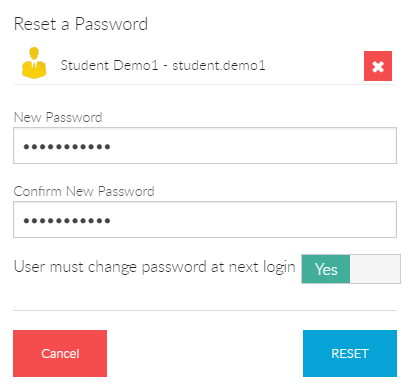 A new static password may be set by the trusted user using the delegated password reset feature and can optionally select the ‘must change password at next login’.